Buck, a powerful dog, half St. Bernard and half sheepdog, lives on Judge Miller's estate in California's Santa Clara Valley. He leads a comfortable life there, but it comes to an end when men discover gold in the Klondike region of Canada and a great demand arises for strong dogs to pull sleds. 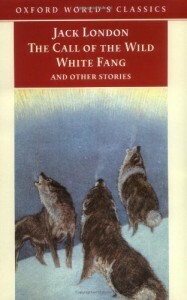 the book call of the wild connects to the book white fang because The she-wolf mates with one of the wolves and has a litter of pups. Only one survives after several more famines, and he grows strong and is a feisty pup. They come to an Indian village where the she-wolf's (who is actually half-wolf, half-dog) master is. He catches her again and White Fang, her pup, stays nearby. Parents need to know that this story has moved kids for years. Its fast-paced drama hooks even reluctant readers. That said, it also reflects the sensibilities of another age. This is a story of survival, which entails a great deal of brutality by and toward dogs. It may be a bit much for sensitive young animal lovers of today, when beating dogs with clubs is not considered an acceptable way of training them. Dogs fight each other to the death, and tear out the throats of dogs and men, yielding geysers of blood when the jugular is ripped open. Buck, the canine main character, is often beaten, once almost to death. But ultimately, this is a story of dignity and leadership that will grip kids and hold them.